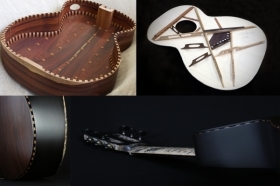 I am extreamly honoured to have been asked by Dr Michele Ducceschi, of the Acoustics and Musical Instrument Technology Department at The University of Edinburgh, to give a seminar of my acoustic principles and other guitar innovations. My talk shall be presented to the researchers and masters students of said department on the 15th of March 2017 at 5.10pm in the Informatics Forum, room 4.33/4.31 (Crichton Street). This is a particularly great honour for me as I have been approached directly by Dr Ducceschi after him discovering my work and becoming excited by my findings. For a scientist to become interested in my developments as opposed to the usual musicians or luthiers has huge meaning to me - that is of course not to dismiss their enthusiasm, that has always, and will continue to be, greatly appreciated and respected. For me, it is of particular gratitude to have a scientist excited by my work as I have always had a scientific approach towards lutherie, as opposed to what I would think of as a more traditional, or religious-esqe approach. There has also been a propossed collaboration to prove or disprove many ideas in lutherie, scientifically, including my own, which I have whole-heartely agreed to - yet, I won't say too much about this just now as this is of course subject to university research funding, which is in the process of being applied for. All of this has come at a time for me when I have been forced out of guitar construction, and in to what shall hopefully be an extremely interesting chapter in my career. I have in recent months been suffering from frequent haemoptysis, this is due to contracting perpetual infections in my damaged lungs. My doctor has now told me that I have managed to get off lightly and had I continued making guitars it would have undoubtably lead to much worse health issues in the near future. Currently I have no signs of cancer. So, with this new potential development, burnt out, but not faded away! I hope very much that I can continue to be a large contributor to the industry. For those interested in what the University of Edinburgh's acoustics department does, just click the brown link below to take you to their website. I very much look forward to meeting all of the students and researchers on the day. 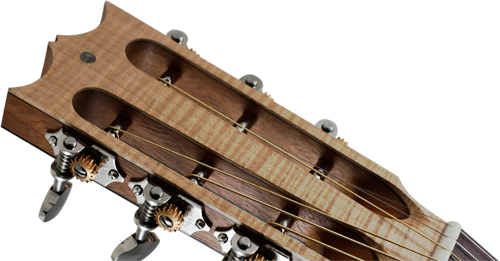 Pictured: David Antony Reid Guitars' multi modal guitar bracing design, halo diffraction vaulted back slits, multi reflection back and sides design increasing reverberation times. All designs and images are copyright of David Antony Reid Guitars, since conception, to which there is a full record of in my published acclaim and website. Use of these designs will only be permitted with written permission by David Antony Reid Guitars.